I dare you to find a richer, more decadent mocha cookie than this one from Gourmet. Kat and I made these munchies for her housewarming party earlier this year, and I recreated them this afternoon to bring to a bonfire tonight (I am daring myself to try them instead of a graham cracker in a s’more, though I may die from sugar shock…). I ran out of white sugar and had to use some brown, which was fine, but I should have gotten all the lumps out in advance because they were a pain to do while cooking. 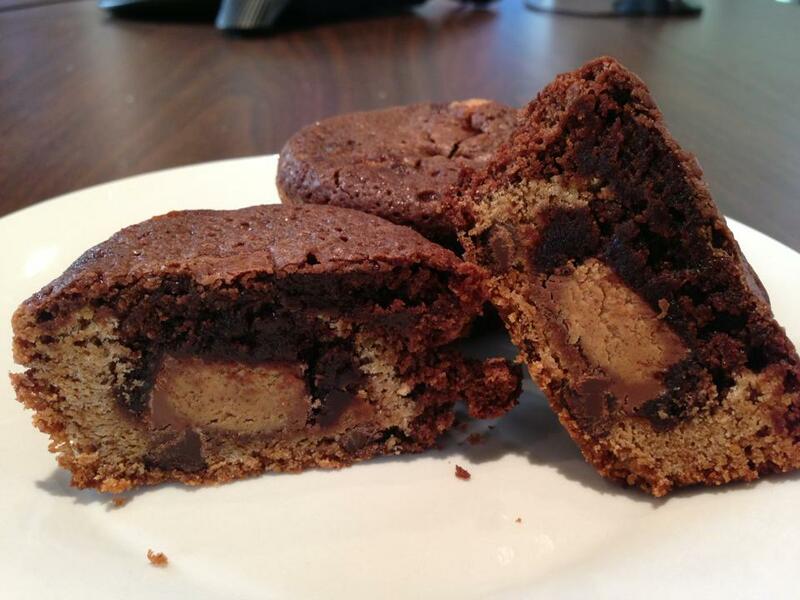 I melted 2 of the cups of chocolate chips and only put 1 cup in before baking – last time, we melted all the chocolate and it was great, so I didn’t want to go to far with their 50/50 breakdown – these cookies are so rich, you don’t really need pockets of chocolate. I tried to bake some in a mini-muffin pan because I ran out of baking sheets. Major fail. I ate way too much batter, and now I am stuffed. In the aftermath of the announcement that Borders is closing, I scurried over and browsed their cookbook section for what could be one last time. I ended up with a book called Cookwise, (by Shirley Corriher) which includes helpful tips and comments on the science of cooking along with each recipe. They tell you what role each ingredient plays, and how you can make easy substitutions. 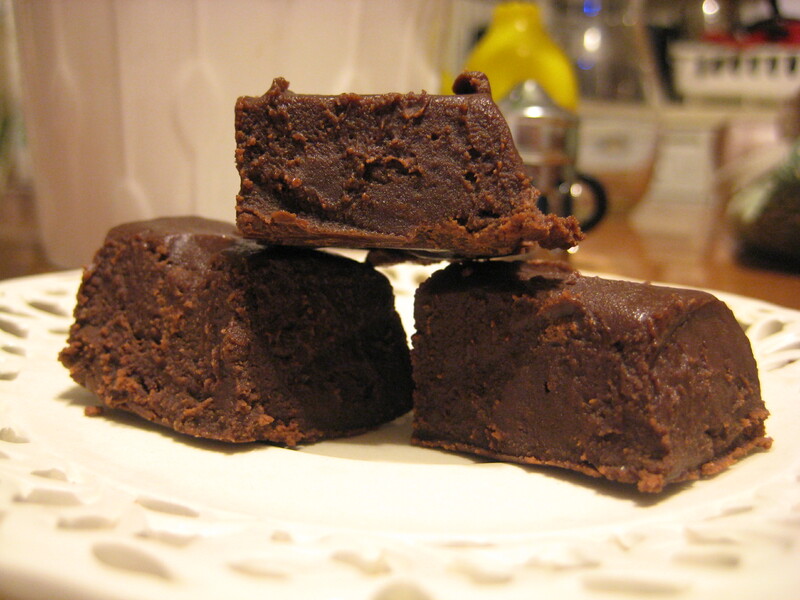 I worked off of their “Sinfully Easy Fudge” recipe but made it even easier for tonight’s cooking adventure. Even so, they deserve the credit – I’m just passing on the excellence. Line an 8×8 pan with foil and grease well (cooking spray works fine). 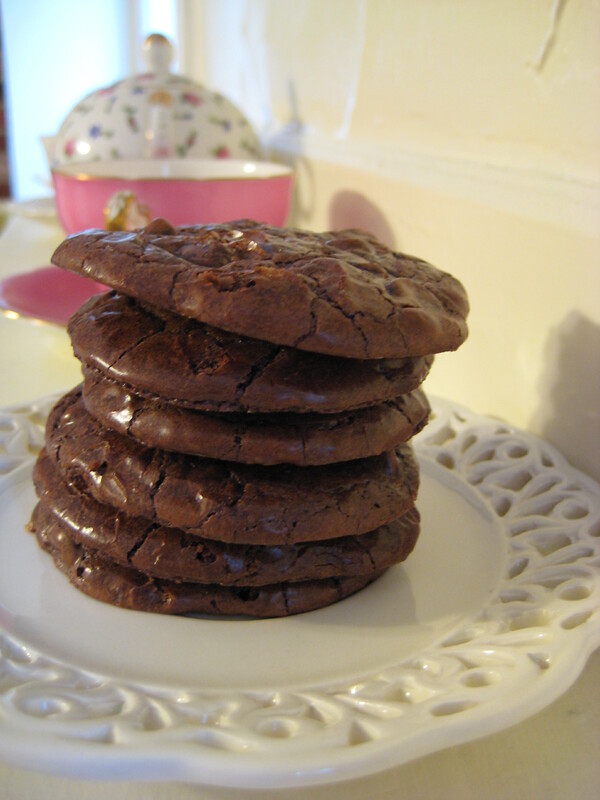 Chop up the milk chocolate chips – I used my mini food processor for this one. The semisweet ones don’t really chop, so don’t bother trying. Add both types of chocolate chips, the sweetened condensed milk, and butter to a saucepan – preferably something with a thick bottom so the chocolate doesn’t burn. Heat over low heat, stirring often. Once the chocolate chips melt, remove from heat and stir in the vanilla extract. Transfer all that chocolate goodness to the pan, and spread it evenly. Pop it in the fridge and let it sit until solid (about 2-3 hours), at which point you can cut it into squares. Done! This makes about 30+ small pieces. As the recipe mentions, this stuff is a little soft because it’s so low on butter, so you will have to keep it refrigerated until soon before you eat it. But it’s totally worth it. I feel like this could also be good warmed up and melted onto a brownie sundae… I’ll let you know if any pieces last long enough for me to find out!